[Knowing your rights as a motorist is as important as knowing which pedal to hit when a tree looms. In a new, weekly feature called "Rules of the Road," Jalopnik's own political and legal wonk Matt Hardigree will cover the auto-related statutes that govern operation, registration and ownership of our cars. Read it. In addition to preventing minor inconveniences, it could determine whether or not you'll become roommates with a guy named "Ashcan" who has a penchant for frottage. — ed.] No one on this site, and no decent person I've ever met, thinks drinking and driving is a good idea. That disclaimer noted, we'll move on to address a common drink-related legal area. Whether returning from a tailgate party or merely transporting boozed-up friends from one kegger to the next, winding up with an uncorked bottle of Boones Farm in your car is a common eventuality. That means you'll be walking the fine legal line. It falls under the scope of the complex maze of state-level open container laws. For reasons numerous and complicated, there are laws the federal government does not pass but rather encourages state governments to pass. One of those is the open-container law, which states there must be no possession or consumption of alcoholic beverages by any passengers, anywhere in a motor vehicle on a public highway or right-of-way. It's a matter of carrot-and-stick governance. The stick is generally a decrease in federal highway building funds (the funds are generally redirected to safety programs). Reasons why states don't pass open container laws range from philosophical complaints (the state can do what it wants), to athletic support (pro-tailgating), to a fear imposing them will impact the money gained from the sale of alcohol. Currently, 39 states meet the full federal requirements (now including Indiana, Montana and Colorado). Further, cops can bust you for having an open container without any probable cause. There are small variations in this law that turn on language parsing (e.g., what qualifies as a moving vehicle and what counts as the passenger area of a motor vehicle). 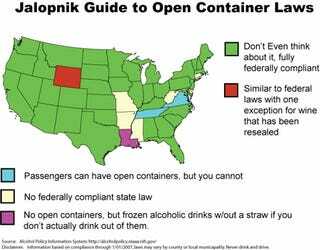 Washington state actually has stricter laws, providing penalties for trying to disguise an open container of alcohol. Some states give counties and municipalities the ability to determine penalties for possession of alcohol in motor vehicles. The bottom line is, consult an attorney and get someone to hide your keys before attempting to drive with an alcoholic beverage. Generally speaking, the laws in Alaska are not at great variation with the federally mandated requirements. The one major exception is that you can have an open container on a "Motor-Driven Cycle," which basically means a motor scooter with less than 50 cc of engine displacement. Limited. No state-wide Open Containers law. Though Louisiana does have a ban on open containers, there is an exception for frozen alcoholic beverages with lids on them. While you can't drink it, or put a straw in it, you can order a 60-ounce Hurricane or Strawberry Daiquiri from a drive-through. While the law prohibits the possession of a beverage or consumption by the driver of a motor-vehicle, the law states that a passenger can have possession of a beverage. While there is no state-wide Open Containers law, the law does prohibit the consumption of a beverage by a person driving a car and says that it is presumed that the driver has consumed a beverage if there is an open container and some other indicator that the driver may be drunk (slurred speech, appearance, odor, et cetera). As you probably have guessed, oenophilia runs rampant in Wyoming. While the law does state that you can't have an open container while driving (your passenger may), you can have resealed wine with you and that does not count as wine.